Andrew Sinclair ARBS is recognised as a master of world-class figurative sculpture. He will be joining us for Prosthetics Jam on the Education Stage and Private View. His impressive catalogue of work graces distinguished historical properties and public places such as the Royal Box at Ascot, Epsom Racecourse, and Crosby Hall (Sir Thomas Moore’s old palace) in London. Working to commission during his 25 year professional career, Andrew’s sculptures are in collections across the globe. His talent extends across all genres of sculpture, from historic bronze re-creations for public spaces and private commissions, commemorative portraits for museums and industry magnates, to award-winning fantasy sculptures such as dinosaurs and dragons. Andrew’s passion is figurative sculpture and he has singularly changed the world of sculpture through his inventions: ‘The Sinclair Methodology’ for creating sculptures and ‘Plastishim’- a product used in mould-making, adopted by major foundries and the film industry as the method of choice. His knowledge, experience, and unique approach is inspirational. Passionate about educating future professional sculptors, Andrew is the lead teacher at The Sculpture School in Devon, which attracts students from around the world. He is renowned as a true authority on sculpture. The first in his forthcoming series of books on how to sculpt using the Sinclair Method will be published this year. Andrew’s expertise and inventive teaching means they are set to become the definitive guides to figurative sculpture education and practice. 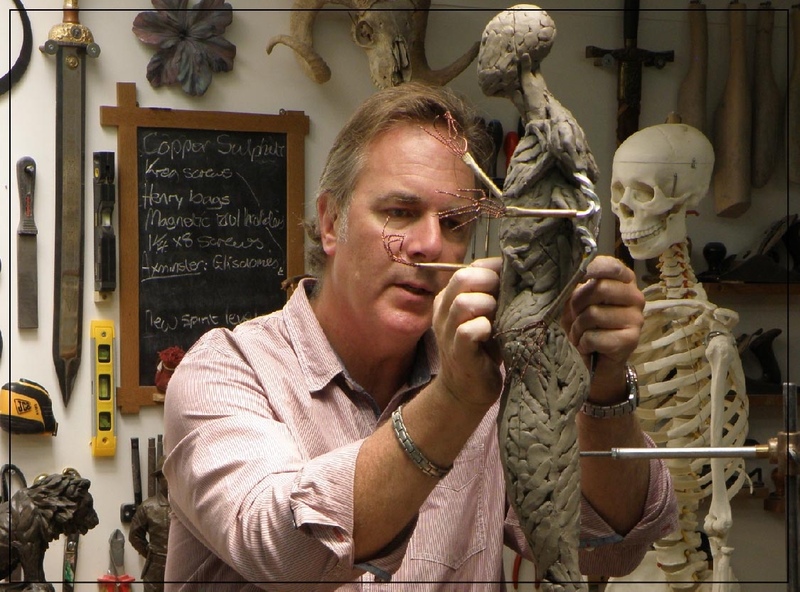 Andrew is an excellent speaker and recognised as a leading educator within the SFX film industry as well as in mainstream sculpture.